ST. GEORGE – It was an event months in the making. 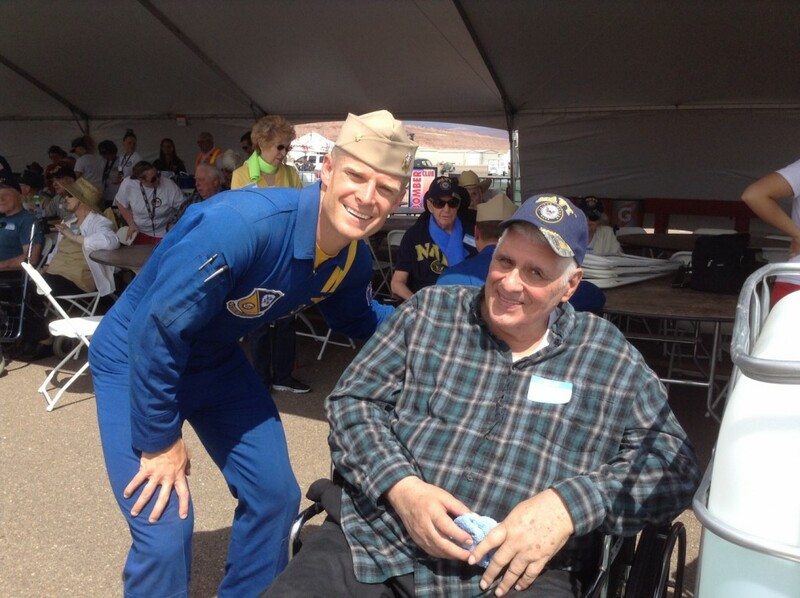 A special audience – front row seats to Friday’s rehearsal flight – for the veterans of the Southern Utah Veterans Home with the United States Navy Blue Angels. 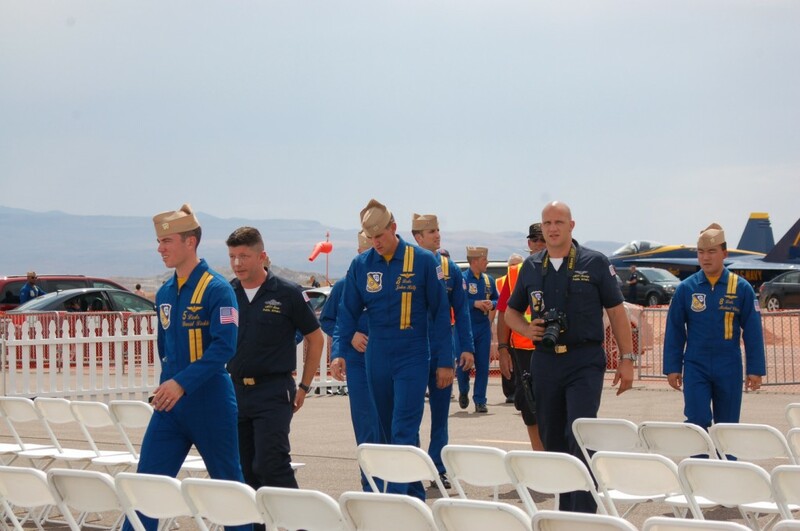 Retired service men and women representing the Air Force, Army, Marines, Merchant Marines and Navy boarded buses on Friday afternoon bound for the St. George Municipal Airport where the Blue Angels have been preparing for the Thunder Over Utah Air Show taking place on Saturday and Sunday. Preparations for the special day started in early spring, recreation director, Vie Van Noy, said and began with securing transportation for the veterans, their caregivers, veterans home staff and volunteers. 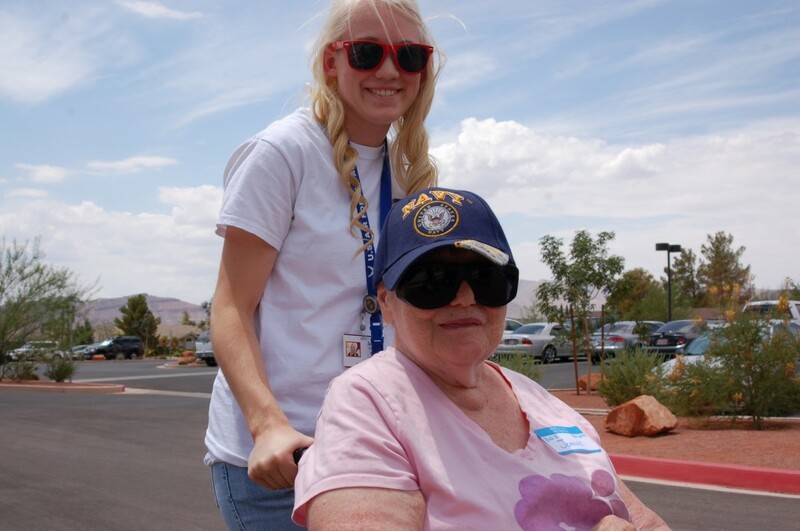 Air-conditioned buses specially equipped for wheel chairs were sent from the Department of Veterans Affairs office in Salt Lake City to transport the veterans from the home in Ivins to the airport. Bus drivers made the long trip specifically for the event, V.A. Emergency Management Coordinator, Jim Stritikus, said. 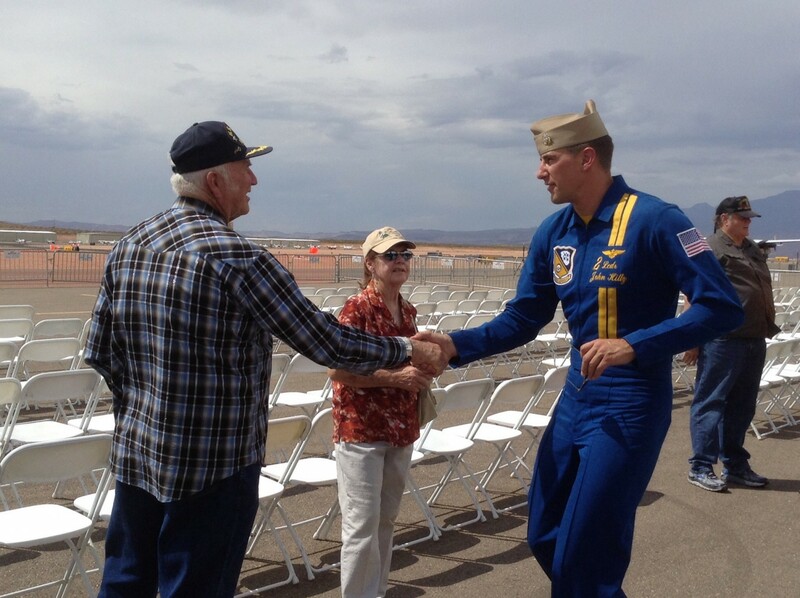 Some 40 veterans, along with family, volunteers and staff attended and anticipation was high for everyone involved. 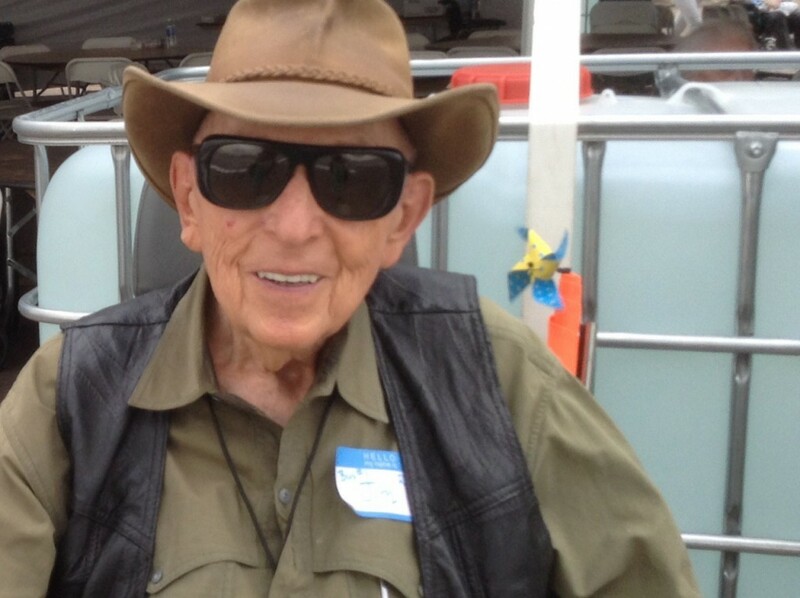 Jim McCullough, a retired Merchant Marine, expressed his excitement at the chance to have a front row seat for the Angels. 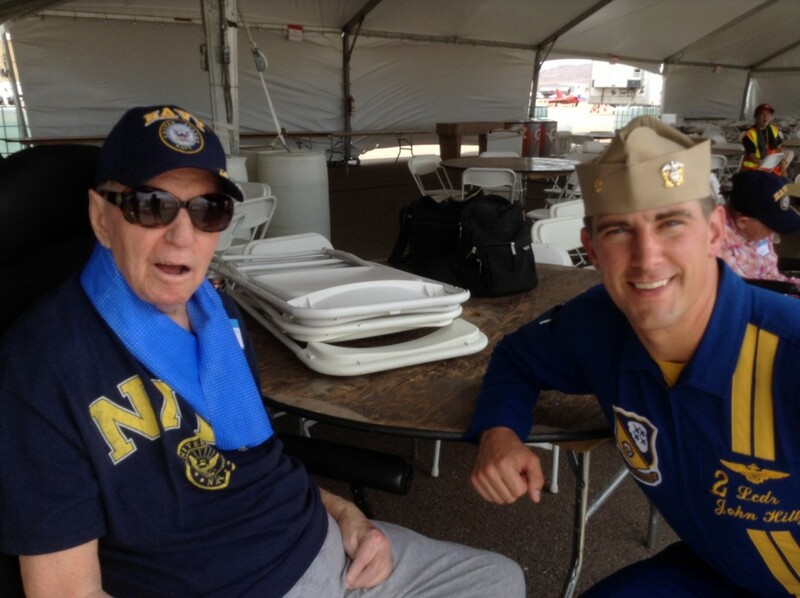 McCullough served as a radio operator on “whatever ship they put me on,” he said. For Ted Moyes, who spent 30 years in the Navy as a dentist, he said it was the opportunity to see the capabilites of the F-18s and the complicated maneuvers they perform that he was excited about. Moyes has seen the Angels fly before, he said, and even has a photo of them in his room. For Van Noy’s part, she was thrilled for the veterans to receive the special treatment and respect they deserve, she said. Speaking of her job as recreation director; what started as a career change for Van Noy – who always respected the flag and our freedom, she said, but always considered the Fourth of July and other patriotic celebrations, barbecue and picnic holidays – has become something so much more now that she works with the veterans and has gotten to know them and of their service. Many logistics and much careful planning went into pulling off the near-private show, Southern Utah Veterans Home administrator, Jerry Olson, said. Cold drinks and snacks were prepared, ear plugs for every veteran were available and all the medical necessities for the veterans home residents were on hand. While most of it went off without a hitch, Mother Nature did put a kink in the plans. 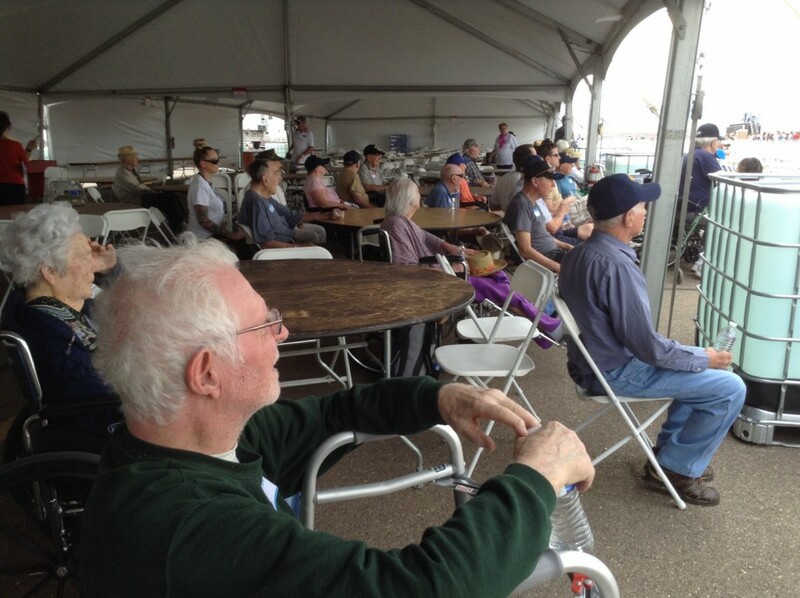 Veterans arrived to a rainy and windy tarmac and took their seats in a reserved tent to watch the pageantry of the U.S. Navy Blue Angels as they were introduced and entered their planes. Music from the popular movie “Top Gun” blared from a loud speaker as the F-18 engines roared into action and smoke billowed from the tails. 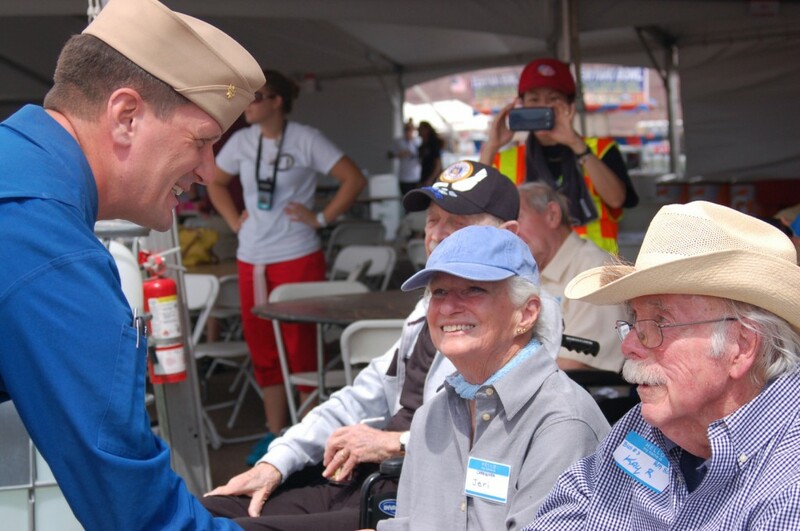 Excitement in the tent was palpable and the veterans could be seen smiling and shifting their seats for a better view. But it was too good to be true and soon the engines were shut down and the pilots exited their planes. Organizers and veterans had been primarily worried about the July heat but, in the end, it was high winds and lightning from an approaching storm that grounded the Angels. Nonetheless, the day did not end on a sour note. 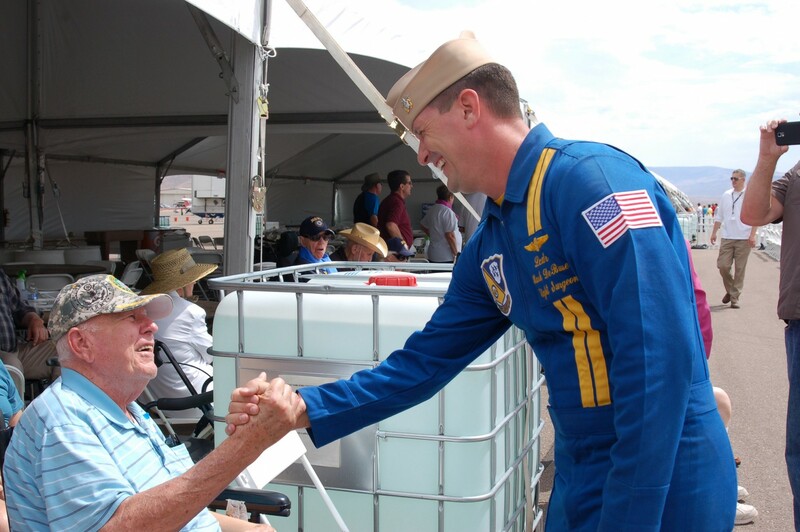 After the flight cancellation, Blue Angel pilots and crew members made their way over to the tent to personally speak with the veterans and thank them for their service. The symbiotic relationship of respect between old guard and new was visible as pilots shook hands with the veterans and posed for photos. “We respect them and they respect us,” Mass Communications Specialist First Class Eric Rowley, said. 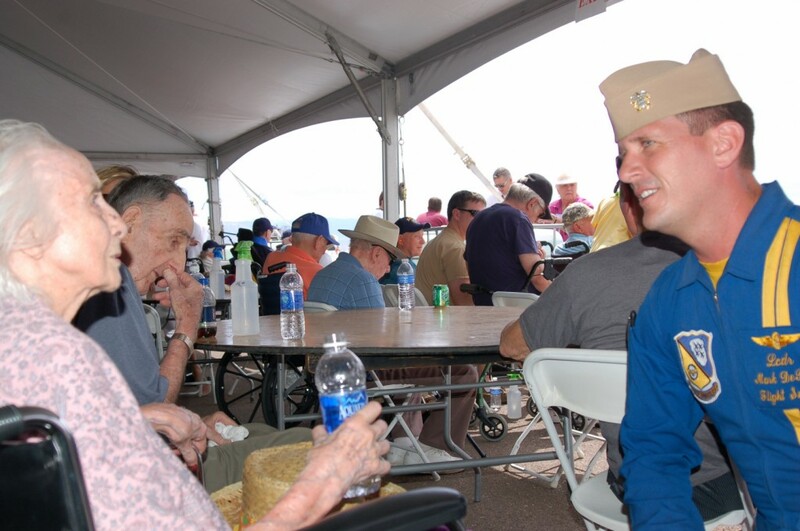 The personal attention by one of the nation’s elite fleets meant a lot to many of the veterans who attended. Service men and women who attended served in many capacities, in many branches of the service and in many locations all over the country and the world; they were nurses, doctors, radio operators, communications specialists, pilots and paratroopers. They defended the United States of America in the air, on land and sea. Their service is over now – they have passed the torch to the brave men and women fighting the hard fight today – but their legacy and their stories will live on. “Thank you to the Blue Angels and thank you to our veterans,” Lewis said. “….Merchant Marines and Navy” PS a merchant Marine is not military or service related. Come on really. Hodja, may I illuminate? 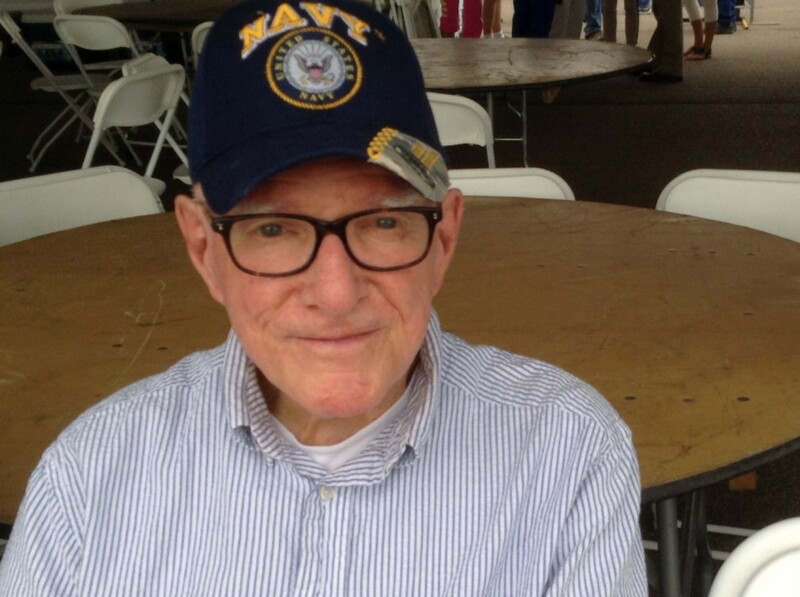 Our reporter included the Merchant Marines because during times of war, particularly WWII, they acted as an auxiliary for the military and they did serve our country by delivering supplies including ammunition to our forces. There was a merchant marine represented at this event and the director also listed them in the branches of service and such that were represented at this event. 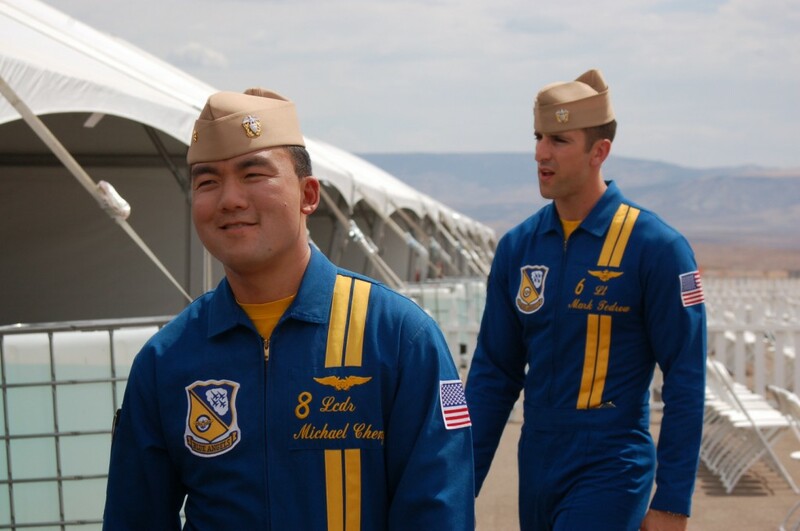 Those who have served were given honor and received honor by these men serving in the U.S. Navy Blue Angels today – a special event.